The New England Walkers elected a new president, saluted their outgoing one, and laid out an agenda for 2014 at their annual meeting Nov. 10 in Groton, MA. The club elected Ed O’Rourke president, Brian Savilonis vice president, Justin Kuo treasurer, Rich McElvery member-at-large, and Charlie Mansbach secretary. Members thanked club founder Tom Knatt for his 31 years as president, presented him with two inscribed cakes, and made plans to name a race in his honor. 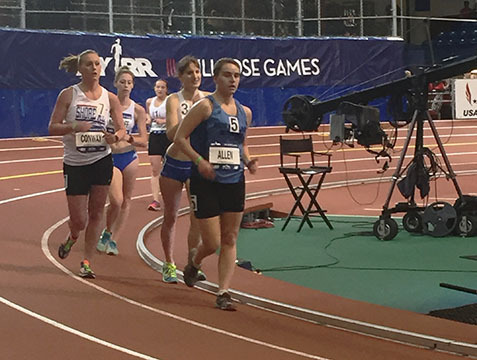 The club voted to give $250 to Valia Vaitones, a 17-year-old walker from New Hampshire, to help her attend a race walking training camp in Texas. The allocation is being made as part of the club’s mission to encourage and develop young walkers. The club will ask Valia to share her experiences on the NEW website. In addition to attracting young athletes, we want to set a goal of getting at least 5 new club members this year from the Masters level athletes. 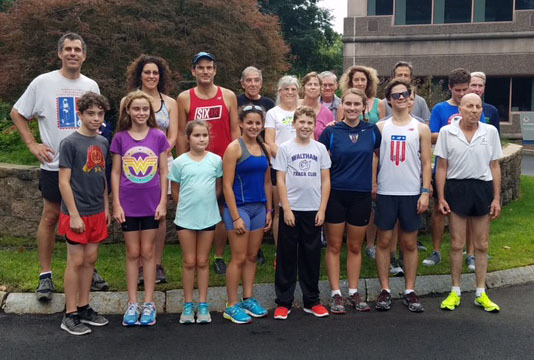 On the same theme of reaching out to more young athletes, we discussed putting our contact information on race walking fliers that could be distributed at events, and of supercharging our website and Facebook page to spread our message. We plan to have regular conference calls to discuss further steps. Ed suggested we have these meetings monthly and the mandatory club meetings quarterly. We want to develop some great ideas we can implement in promoting the sport ad the club. We also will explore whether we could pique further interest by distributing appealing race walking T-shirts. We will investigate the choices and prices. After the national-level complications that prevented us from hosting the USA one-hour championships in 2013, we voted to tell our national representatives, Steve Vaitones and Justin Kuo, that we would be willing to host the national 5K, 10K, or one-hour championship in 2014. Also included, whatever local national championship we may wind up hosting, and the Connecticut 10K. Walkers may also include an out-of-town national championship. Brian proposed regular club workouts on the rail trail in Groton, perhaps as an alternative to the often-sparsely attended races at Danehy Park in Cambridge. Ed said we need to create clusters where walkers can find us. More discussion will follow. The meeting was hosted by Ed and Deborah O’Rourke. Also attending were Beth Katcher, Tom Knatt, Rich McElvery, Joanne and Bill Harriman, HIlary and Bob Keating, Ann Neuburg, Brian Savilonis, and Charlie Mansbach. Here are the results of the Riverdale 10-kilometer and 4-kilometer Race Walks in Brookline, MA. The unjudged race walk/clinic was held on Sunday, September 8, 2013.